While in Venice we stopped in for lunch at Ristorante da Ivo with Nereo Zane and a few other friends. I love this place, and they've been very supportive of past rowing expeditions - including our adventure down the Hudson in '07. And then there's the fact that the food is excellent. 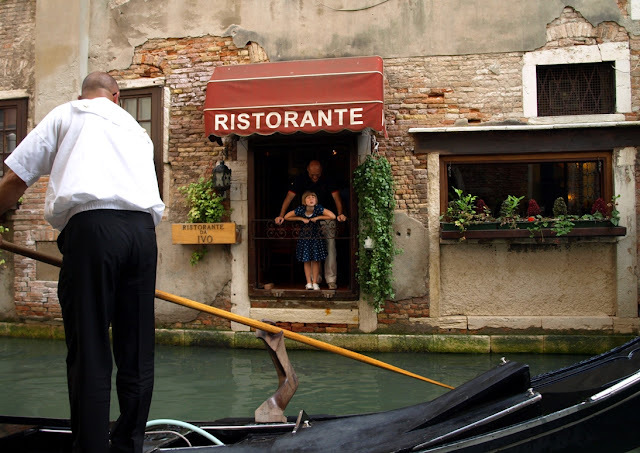 So we had ordered our meals and I saw the procession of gondolas gliding by outside and decided to go snap a few shots of them while the food was being prepared. Five or six boats went by and I noticed some familiar faces in my viewfinder: Nereo and my daughter Isabella (eight years old at the time)...who was sticking her tongue out with just the kind of sass that she's known for. I'm really not sure if the gondoliers who passed by realized she was sticking her tongue out at me, or if they thought it was directed at them. 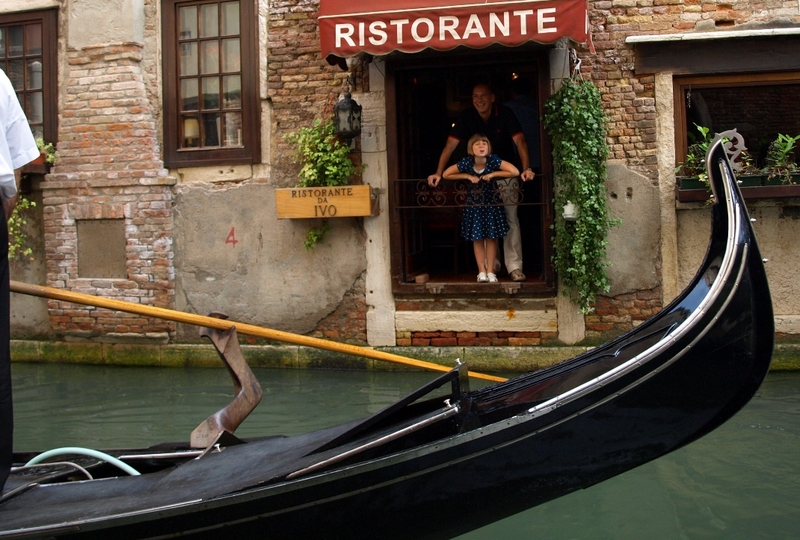 There are hundreds of great places to see and photograph gondolas and other boats in Venice, the spot outside Ristorante da Ivo is just one example. "Just the Photo - Gondola Framed by Iron"
"The View from Ristorante da Ivo - A Quiet Moment"
"The View from Ristorante da Ivo - Just a Hunch"
and "The View from Ristorante da Ivo - Ponte de le Colonne"
And after she stopped sticking her tongue out, my daughter actually picked up the camera and shot a few good frames of her own. "Da Ivo Window Sequence 1 - gondola"
"Da Ivo Window Sequence 3 - Sandolo"
"Da Ivo Window Sequence 3 - Another Gondola"
Interesting how a cute little girl (when she's not sassing) can get some great reactions from the people she's photographing.